Echoflex Solutions Inc. introduces an industry first with the new OWS series of Wall Switch Sensors. Available in PIR and Dual Tech PIR/Acoustic sensing models, the new OWS Wall Switch Sensors are line-powered, wall-mount, occupancy/vacancy sensors with an integrated rocker switch that communicates wirelessly to Echoflex controllers. The OWS is a no-neutral conductor-powered device connecting to line voltage and earth ground (<0.5mA). The OWS sensors are ideal for installation in small offices and boardrooms that require on/off switching, dimming, occupancy/vacancy sensing and occupancy-based plug load control. 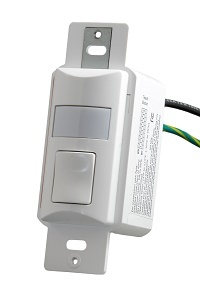 To find more information on the Dual Tech Wall Switch Sensor, visit www.echoflexsolutions.com. A growing number of commercial projects now require building management systems (BMS) to be capable of interfacing via BACnet/IP. The Wattstopper solution, the BACnet-enabled InFusion Controller, helps industry professionals meet this requirement in the most cost-effective and simple way. The ability for the BMS system to have greater control and receive feedback from the Wattstopper architectural dimming platform provides opportunities to increase energy efficiency, building optimization, and user convenience. Gemalto's Cinterion ​EHS6 Terminal is a simple and reliable plug-and-play 3G M2M connectivity device that allows new M2M implementers to quickly connect their industrial applications using wireless technology. With very little integration and approval effort, it provides a cost effective, swift solution for improving enterprise optimization technology. With Java embedded, the EHS6T device ​offers easy and fast application development, a broad choice of tools, reusable exist​ing code​, easy maintenance, a proven security concept, on-device debugging as well as multi-threading programming and program execution. About the size of credit card and encased in robust plastic housing, the miniaturized terminal works in virtually any application providing secure 24-7 connectivity. For quick and easy implementation, the terminal is compatible with a variety of mounting schemes. The Smart Communication Sensors measure a selection of variables including temperature, CO2 levels, fan speed, relative humidity and more subject to the model built. All of sensors can communicate via the BACnet MS/TP or ModBus RT protocols. Not only are these Smart Sensor’s packed full of potential, they’re also affordable for the quality and reliability on offer. With multiple measurements taken over a two-wire data bus and capability to detect auto baud rates; the sensors are perfect for total environmental sensing. Sontay Smart Communication range also includes the ST-TOUCH, a touchscreen thermostat, which offers intuitive ambient temperature control to maximize energy efficiency. With its slim cell-phone like design and touchscreen operation, the sensor is perfect for contemporary commercial and residential applications. The sensor can be flush or surface mounted and is easy to programme and use. For 2017, Sontay is introducing a Smart Power and Energy Meter, which will provide users with the ability to monitor and manage their energy usage while transmitting data via Modbus RTU or BACnet MS/TP. It is extremely easy to install, commission and operate for installers as well as being fully compatible with CTs from 5-5000A.